The famous table! So it appeared in The Principles of Chemistry, the textbook Mendeléeff (so the name was often transliterated in his lifetime) wrote in 1870, unable to find a published work suitable for his students. Rarely in history has an introductory textbook for undergraduates exerted so dramatic an influence on human thought: "I also wished to show in an elementary treatise on chemistry the striking advantages gained by the application of the periodic law, which I first saw in its entirety in the year 1869 when I was engaged in writing the first edition of this book, in which, indeed, the law was first enunciated." Chemistry for Mendeléeff was one of the two "archi-real" sciences, the other being Newtonian mechanics. The latter dealt with the macrocosm, the former with the microcosm and the atom. "Mechanics may be likened to the science of statesmanship, chemistry to the sciences of jurisprudence and sociology. The general universe could not be built up without the particular individual universe, and would be a dry abstract were it not enlivened by the real variety of the individual world. Mechanics forms the classical basis of natural philosophy, while chemistry, as a comparatively new and still young science, already strives to -- and will, in the future -- introduce a new, living aspect into the philosophy of nature; all the more as chemistry alone is never at rest or anywhere dead -- its vital action has universal sway, and inevitably determines the general aspect of the universe." It is tempting to see in these words an anticipation of the Twentieth-Century divide between deterministic, macroscopic classical-mechanics and free, microscopic quantum-mechanics. Nineteenth-Century readers, however, would have been impressed by the archaic flavour of romantic Natur-Philosophie. Born in 1834, Mendeléeff was at heart from an earlier generation; he would have been at home in Goethe's Weimar. His tempestuous, passionate love-life, his deistic religious beliefs (equally annoying to his pious Orthodox sister and his free-thinking associates in the Russian intelligentsia), his defiance of social convention, his vision of the Sublime -- all Romantic, sentimental, traits, and yet, as in Goethe there is also in Mendeléeff the philosophe's commitment to Reason and Progress: a personality divided like the two halves of Faust. "Knowing how contented, free, and joyful is life in the realm of science, one fervently wishes that many would enter its portals." Mendeléeff spent his life -- as a student (the victim of an arbitrary rule barring Russians born in Asia from attending the University of Moscow), as an educator (in high schools before he was allowed to teach university courses), as a researcher, as a government official -- battling for Reason, or Reason as he saw it. He fought against the forces of superstition and conservativism, against the intransigence of colleagues, against the obtuseness of the czarist bureaucracy in which he was obliged to serve, against the Church's tiresome insistence on the sanctity of marriage vows ... but always for Reason! And now it is 1902. "I think I have not many years for delay." Reason is on the decline, even in the realm of chemistry. The great men of Cambridge are rumoured to be attending séances. Alchemy has once again reared its hydra-like, undefeated head: "the formation of new unlooked-for atoms and the disappearance of portions of the elements during experiment ... A belief in such a possibility has long been held in the minds of many by force of superstition ; and the more recent researches of Emmens to convert silver into gold, and those of Fittica (1900) to prove that phosphorus can be transformed into arsenic, show that it yet exists. In the fifty years during which I have carefully followed the records of chemistry, I have met with many such instances, but they have always proved unfounded ... [A] series of recently discovered physico-chemical phenomena ... not subject to the ordinary doctrines of science ... have caused many to return to the emission theory of light, or to accept the, to me, vague hypothesis of electrons ... Some persons also assume that atoms can be split up into their dust or primary matter, just as comets break up into falling stars ... [N]o fact points to the possibility of the transformation of one element into another." There must, surely, be a non-alchemical explanation for the strange new effects which the Curies had shown him on his visit to Paris, an explanation which preserved the uniqueness of each element -- for it is this uniqueness which philosophically underlies all of Mendeléeff's chemical thought: "[F]or mechanics treats of matter as a system of ponderable points having scarcely any individuality and only standing in a state of mobile equilibrium. For chemistry, matter is an entire world of life, with an infinite variety of individuality both in the elements and in their combinations. 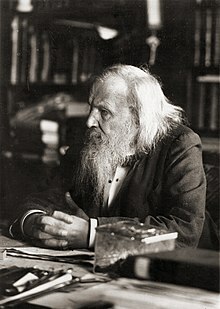 In studying the general uniformity from a mechanical point of view, I think that the highest point of the knowledge of nature cannot be attained without taking into account the individuality of things ..."
The atom built of what would soon be called protons held no appeal for Mendeléeff: "When in 1869 I first showed the periodic dependence of the properties of the elements upon their atomic weights ... it never occurred to me that hydrogen might be the starting point of a system of elements ... [I am] unable to conceive the formation of the known elements from hydrogen ... And when I am told that the doctrine of unity in the material of which the elements are built up responds to an aspiration for unity in all things, I can only reply that at the root of all things a distinction must be made between matter, force, and mind ; and that it is simpler to admit the germs of individuality in the material elements than elsewhere, and that no general relation is possible between things unless they have some individual character resident in them." "Eight years ago ... all the known elements were, directly or indirectly, capable of entering into mutual combination. But in 1894 Lord Rayleigh and Professor Ramsay discovered argon and defined it as the most inactive element ; this was followed by the discovery of helium, the existence of which Lockyer had predicted by its spectrum as a solar element, and subsequently by the separation of neon, krypton, and xenon from air. None of these five new gases have yet given any definite compounds ... When, in 1895, I first heard of argon and its great chemical inertness, I doubted the elementary nature of the gas, and thought it might be a polymeride of nitrogen, just as ozone is a polymeride of oxygen ... I have now long discarded this, and consider argon to be an independent element, as Ramsay held it to be from the very beginning ... And if the analogues of argon do not form compounds of any kind, it is evident that they cannot be included in any of the groups of the previously known elements, but should form a special zero group which at once expresses the fact of their chemical indifference. Moreover, their atomic weight should necessarily be less than those of Group I, but greater than those of the halogens ..." Thus a new column, the noble gases (though as a political liberal Mendeléeff would hardly have approved of the term), makes its appearance. An important breakthrough, but what is its bearing on radioactivity? The title of the work in which Mendeléeff presents the new column, An Attempt Towards a Chemical Conception of the Ether, provides a strong hint. If one examines the new chart closely, one finds not only the familiar noble gases, but also an element, marked "y", above helium, and another ("x") above that. "Here x and y stand for two unknown elements having atomic weights less than that of hydrogen, whose discovery I now look for." The noble gas y has perhaps already been discovered; it may be " coronium, whose spectrum, clearly visible in the solar corona above (that is, further from the sun than) that of hydrogen, is simple like that of helium, which seems to indicate that it belongs to a gas resembling helium" floating buoyantly atop the the sun's atmosphere. More importantly, the noble gas x can only be one thing: the luminiferous æther. Nineteenth-Century physicists nearly all believed in æther, but few had considered its chemical nature, for Mendeléeff obviously its most important property. "The recognition of the ether as a gas, signifies that it belongs to the ordinary physical states of matter, gaseous, liquid, and solid. It does not require the recognition of a peculiar fourth state beyond the human understanding (Crookes)." This is a sneer at the most unabashed of the séance-patronising British physicists. "All mystical, spiritual ideas about ether disappear. In calling ether a gas, we understand a 'fluid' in the widest sense ; an elastic fluid having no cohesion between its parts. Furthermore, if ether be a gas, it has weight ... "
Studying the æther in the laboratory obviously poses a tremendous challenge to the chemist. The earth, and every object on the planet, is constantly rushing through the æther sea with hardly any interaction: "it cannot be isolated from substances, which indeed behave in respect to ether like a sieve to water or air." A modern reader might think of the neutrino background; Mendeléeff avoids, for obvious reasons, the unsettlingly alchemical image of a universal solvent. "The capacity of the ether to penetrate all substances may, however, be regarded as the ideal of the diffusion of gases through metals and other diaphragms. Hydrogen, which has a small atomic weight and is the lightest of all known gases, not only diffuses more rapidly than any other gas, but also has the faculty of penetrating through walls of such metals as platinum and palladium, which are impervious to other gases." There follows an aside about palladium hydrides, ironically anticipating a famous quasi-alchemical controversy of 1989. Easy kinetics permits Mendeléeff to calculate æther's atomic weight on the assumption that its velocity exceeds escape for any star. Unfortunately, this requires knowing a maximum stellar mass. Gamma Virginis is the most massive star known in 1902, said to weigh 33 solar masses; Mendeléeff guesses a maximum possible mass of 50, about half of the limit later proposed by Eddington. From the escape velocity of such a star and the kinetic theory of gases he concludes that an atom of æther has a mass about one-millionth that of hydrogen -- a Twenty-first Century physicist would say "1 keV". Interestingly, he also considers the possibility that the correct velocity in the kinetic formula should be that of light, although he doubts that bodies sufficiently massive to trap light ("black holes", we would say) exist. In this case, the atomic mass of æther, inversely proportional to the square of the velocity, turns out to be about 50 meV (with a lower-case m!) -- amusingly close to Twenty-first Century estimates of the neutrino mass. The reference to light-speed is surprising, since Mendeléeff otherwise evinces no interest in the optical aspects of æther theory, much less in the Michelson-Morley experiment. One of his reasons for rejecting the lower-mass æther is that it might lead to a "revival of the emission theory of light" with æther atoms as photons, an idea which Mendeléeff seems to have abhorred for reasons unknown to me. Having established some basic properties of element x, the next order of business is to explain radioactivity. "[W]hat I saw in M. Becquerel's laboratory and heard from him and Monsieur and Madame Curie, gave me the impression of some peculiar state proper chiefly (but not exclusively, just as magnetism is chiefly, but not exclusively, the property of iron and cobalt) to uranum and the thorium compounds. As uranium and thorium ... have the highest atomic weights among the elements, they may be looked on as suns ..." By this strange statement, Mendeléeff means that, just as massive stars with their strong gravity will trap atoms of light gases which would escape from smaller stars or planets, so heavy atoms, with the "highest degree of that individualised attractive capacity, a mean between gravity and chemical affinity," will have the largest cross-section for æther atoms. "And the lightest of gases, x, will also accumulate about the heaviest atoms of uranium and thorium, and perhaps change its form of motion like a gas dissolved in a liquid. This will not be a definite act of combination ... like the motion of a planet and its satellites, but ... resembling that of a comet ... just as a comet falling from space into the planetary system revolves round the sun and then once more escapes into space. If such a special accumulation of ether atoms about the molecules of uranium and thorium be admissible, they might be expected to exhibit peculiar phenomena ... It seems to me that the optical and photo-radiant phenomena, not to mention the loss of electrical charges, indicate a material flow of something which has not been weighed ... "
Most atomic researchers around 1900 were confused by the complex array of processes lumped together as "radioactivity": electromagnetic gamma-rays, leptonic beta-rays, alpha rays made of helium, "emanation" today identified as radon gas. Ironically, the experiment which Mendeléeff describes in the most detail as an illustration of diffusion by the "lightest of all gases" seems to me most easily explicable in terms of the heavy gas (and decay product) radon diffusing from a tube of radium into an attached vessel containing zinc sulphide. Mendeléeff's paper concludes: "It seems to me that this conception of ether, as a peculiar all-permeating gas, gives a means, if not of analysing such phenomena [as radioactivity], at all events of understanding their possibility ... And even if it be found impossible to recognise in the ether the properties of the lightest, most mobile, and chemically inactive gas, still, if we keep to the realism of science, we cannot deny its substantiality, and this requires a search for its chemical nature ..." Mendeléeff died in 1907, two years after Einstein's annus mirabilis.